Today, i will talk about one of the patterns which i usually use while writing unit tests. Apart from MOQ library, i also use Fluent Assertions(http://www.fluentassertions.com/). You can search for the same in nuget package manager and install it in the test project. Out of the box, fluent assertions give tons of extensions method which help to easily write assertions on the actual like shown below. 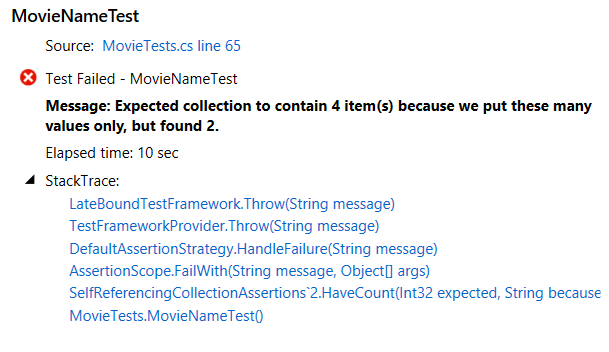 In the below example, i am just running the test against one sample string of my name. When, i run the same it will produce the below result. Similarly, To verify that a collection contains a specified number of elements and that all elements match a predicate, you can test like shown below. Now, when i run the above test, it will fail. And this will fail for a valid reason. But, look at the error message returned by the same. Let, me show the same against one of the infrastructure code where i am using the same. Now, it has one dependency on MovieRepository(out movie). Basically, this is my arrange. 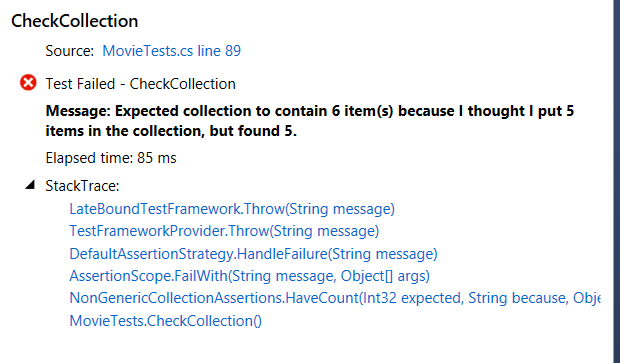 When, i run the above test, it will again throw similar error because count is 2 and i am checking for 4. Thanks for joining me. I hope you like it.